The Sunday Post is a weekly meme hosted by Kimberly at the Caffeinated Reviewer! 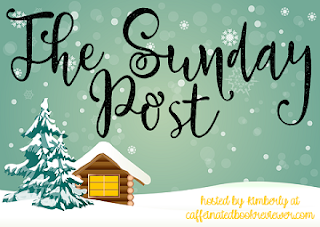 It's an opportunity to share news, post a recap for the previous week, showcase books, and highlight what's planned for the week ahead. We went to Legoland this week! We've never been before, so it was an exciting experience for all of us. We'll have to go back this summer when the outdoor water area is accessible (it looked pretty awesome when we walked by). The girls were too short for a few of the rides, but they were able to participate in everything else! Our son's favorite part was building cars to race down tracks with his dad. It was such a great family day! My husband is building me another bookshelf, and it's almost finished! I should have a picture to show you next week, but it's currently in it's final stages of sanding and whatever else that entails. Yes, he is pretty perfect! ;) My current bookshelf is one he built for me while we were dating, and it has been too full for too long. After the bookshelf, he has plans to build us a larger dining room table, and I'm really looking forward to having bench seats for the kiddos. I actually finished A Curse so Dark and Lonely shortly after writing this post! It was too good to put down, and I was completely wrapped up in the story. I'm not normally a fan of retellings, but I've enjoyed Kemmerer's books in the past (and met her this past November at a signing! ), so I decided to give this one a shot. It was amazing! Truly! I cannot wait to see where the story goes from here. Look for my review tomorrow! 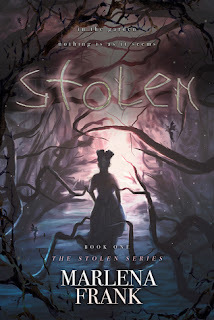 Stolen is a book I accepted for a blog tour. There was just something about the cover and the synopsis that really intrigued me. I opened it for the first time this morning, so I haven't read enough to have an opinion. Seafire is another wonderful book! I've been listening to the audiobook for it, and didn't realize it was narrated by Rebecca Soler -- love her! She also narrated The Lunar Chronicles by Marissa Meyer. I'm loving the all-female crew, and how passionate they are about saving their own. I'm looking forward to all three of these! I've had my eyes on Courting Darkness for awhile now, and I'm really excited to have an opportunity to read it. 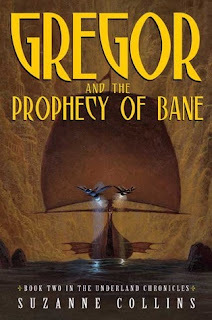 Gregor and the Prophecy of Bane is the second book in the series, and my son has been asking me to read it since we finished the first book (but there were others we wanted to read, too). 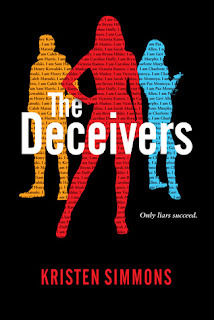 I don't know much about The Deceivers, but I won a copy and have enjoyed Simmons' books in the past! We finally watched Ant Man & The Wasp and The Greatest Showman. I really enjoyed both! I've always loved musicals, and The Greatest Showman was no exception. Hugh Jackman's voice always does something to me -- it's mesmerizing! Even when he's playing a grouchy Wolverine in the X-Men movies, haha. I'm still watching Fairy Tail episodes as they pop up, and I'm really curious how this show is going to end. I started Sirius the Jaeger on a whim yesterday, and it's pretty gruesome. I wasn't expecting all the violence, but the story has been enjoyable as well. It's anime, vampires and werewolves, and a group of people that hunt vampires down. I'm only a few episodes into it, so I know they're both after something, but I'm not sure what that is. I'm happy with my progress so far! I should have a discussion post later this week, and my goal is to do at least one every month. What has been your favorite read this month? I might want to add it to my list! My brother took his kids to Legoland when they were little. They had a good time too. Oooh a new bookshelf is nice. Looking forward to seeing pictures. He's building you a book shelf? He's a good husband. I always wanted to go to Legoland. It looks so fun. Legoland was a blast! It will be even more fun when the girls are a tad older and can do all of the activities. Our son was able to drive a Lego car around a track, which the girls really wanted to try themselves. Fortunately, all of rides have building areas, so the girls were able to play with Legos while their brother did some of the rides. I'm with you on The Greatest Showman and Hugh Jackman's voice! Both amazing. 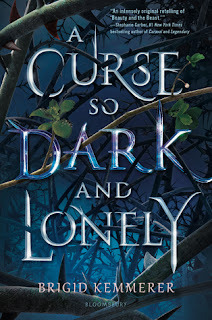 I'm also loving A Curse So Dark and Lonely although my reading slump is meaning I'm reading it in bits and pieces. I love fairytale retellings though... Or I love Beauty and the Beast ones. B & B is my favourite. 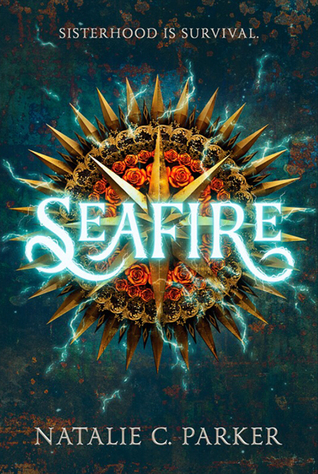 Seafire looks pretty awesome, I remember seeing that one and thinking ooh it looked good! I think the kiddos will like the bench seats, but I want them because they'll be easier to clean after meals! Legoland was about three hours away, so it's still a decent drive. I doubt we will do that often! They're still too young for long drives. Oooh! Legoland sounds like fun! I need to go there someday! Wow, your husband sounds amazing! I asked my husband to build shelves for me, and he laughed. I loved The Greatest Showman, I think I sobbed through the whole film! He is amazing! Why did your husband laugh?? You should tell him it's his responsibility to build you bookshelves. It's part of the relationship agreement. ;) The Greatest Showman was fantastic! I'm really starting to like Zendaya, too. She was a great MJ in the Spider-Man movie, and I loved her in The Greatest Showman. The soundtrack for the movie is incredibly contagious -- sang it for days! I'm glad you had fun at Legoland! My nephew would LOVE it there. And your husband does sound pretty awesome. ;) I really loved The Greatest Showman! Such great music. I decided to read the manga of Fairy Tail after I watch all the anime again, just because somethings in the manga were apparently different. Ooh, homemade bookshelves. Mine came from Ikea, so they’re only a little homemade. I’m glad Legoland was a fun adventure. I wish we had more stuff like that around here. Have a good week! "Mine came from Ikea, so they’re only a little homemade." Hilarious! Seriously, I almost spewed water all over the computer, and we just got it back! :) I'm going to try and post pictures of my shelves next week, although my husband is wanting to redo some things on the original bookshelf. It has been with us for many years, so when our dogs were puppies and chewed on everything (like the base of the bookshelf), and it's a little scuffed from our moves. Legoland was a fun adventure! We haven't lived near one before, so we took advantage. We have frequented a DoSeum, though. Do you have one of those? Can't wait to see your bookshelf! 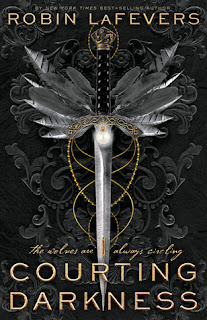 You are going to love Courting Darkness, so good! I'm happy to hear that! I was planning on starting it once I finish Stolen. It's a pretty hefty book! How long did it take you to read through it? Never been to Lego Land. That must be awesome! Anyway, looking forward to seeing your finished shelves. I wish my hubby is that handy. Haha. It's nice to have a handy husband -- heh! ;) <3 Legoland was a blast! They also have 4D movies you can watch, and they cycle through different shows. We were blasted with air, sprinkled with water, and even had snow falling on our heads! What fun!! My mom and Grandma took my little cousins to lego land a few years ago and they loved it as well! We went to Legoland last August and had so much fun! You definitely have to go to the water park next time you're there and it's summer time. We spent two days there and the majority of the second day was spent at the water park lol. It was a huge hit and a ton of fun! Good to know! We were only able to see the water park from the outside, but it looked like a lot of fun. It wasn't a massive area, but it looked like there was a lot for the kiddos to do. I wonder if Legoland has issues with wet kids running around inside during the summer? Haha. Click the "Notify me" box if you want to be notified when someone responds! Vegan. Feminist. Ravenclaw. Aspiring Minimalist. Lover of books and fuzzy socks. Comic book enthusiast. Mom. Spouse. Occasionally, She-Hulk. My Spirit Animal is the White Rabbit from Alice's Adventures in Wonderland. "Hello, I'm late, I'm late, I'm late." 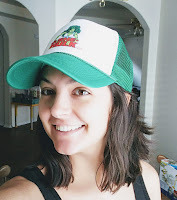 9/23/18: Book Blogger Icon Tags! Share book reviews and ratings with Lindsi, and even join a book club on Goodreads. Q  Do you watch book trailers? Lindsi (Do You Dog-ear?) has read 0 books toward her goal of 500 books.